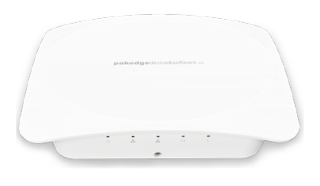 The What: The Packedge WK-1 is an enterprise-grade 802.11ac wireless access point that provides high-range wireless at blazing fast speeds. Designed with 2x2 radio, the WK-1 boasts three times the speed and throughput of wireless-N access points. It is capable of supporting twice as many clients as wireless-N and a greater useable range. The What Else: The new Pakedge WAP is powered by PoE+ and with a high signal-to-noise ratio, it delivers a clear signal from anywhere--making it ideal in hard to reach places. Included brackets allow the WK-1 to quickly and easily be mounted to standard or drop-tile style ceilings and walls. Because it is PoE powered the WK-1 does not need to be plugged into a power outlet, allowing integrators more freedom in deciding where the WAP could be placed. The Bottom Line: The 802.11ac WAP is Pakedge Connect+ certified, so that it leverages other Pakedge devices on the network to optimize functionality. For example, when paired with the C-36 wireless controller Pakedge’s Smart Wav technology uses proprietary intelligent software algorithms to enhance wireless transmission and reception by reading the wireless environment and adapting accordingly. When unified with the BakPak Cloud Management System, the functionality of the Pakedge Connect+ Platform is extended with cloud-enabled services such as the monitoring and management of all connected devices anywhere, anytime, and from any device.